In July, 1964 I received my first amateur license as WN3BGE. Fifty years later, I’m still at it, now taking part in competing at the highest level of amateur radio competition at WRTC2014. I’m 64, and have been retired since 2009 from WJW-TV in Cleveland, where I was an engineer for 39 years. For the last 22 years I was in charge of their TV transmitter facility. I’m an electrical engineering graduate of Case Western Reserve University, where I was an active contester in the late 60’s and early 70’s from the club station W8EDU. In recent years I’ve operated the major DX contests as part of the K8AZ multi-op team. 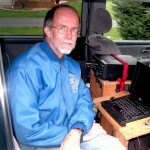 Since 2000 I’ve been active as a mobile in various state QSO Parties. My home station is a decent but not superstation – a tribander at 20 meters, dipoles for the low bands, and single Yagis for VHF/UHF. From home in enjoy the ARRL Sweepstakes, Sprints, QSO Parties, VHF contests, and the lesser DX contests. I’m not (yet) into RTTY contesting. I’ve had the good fortune to experience DX contests from places such as VP2E, VP5, FS, HI, KH6, EI, GW, 9M6, and PJ2T. Some of my other interests include bicycling, bridge, tennis, and classical music. I’m married with two adult daughters. My wife has recently retired, and we are looking forward to spending at least our winters in places warmer than Ohio. I am honored to be competing in the WRTC2014. While I’m looking forward to a good contest as a sought after station, I’m especially looking forward to meeting a lot of those people from around the world with whom I have been competing and sharing my love for ham radio contesting for nearly fifty years.